For a writer, repurposing content is the ultimate recycling program. 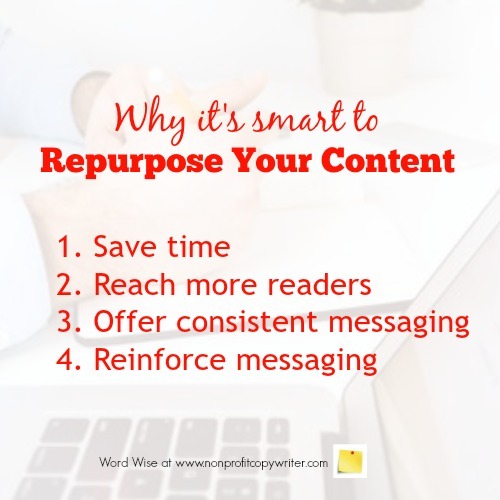 Repurposing your content seems so simple that you may feel it’s a cop out. If you’re a smart, efficient communicator you recognize that you need to repeat your message in different formats to drive it home. Just as recycling aluminum cans or newspaper uses fewer resources than making new ones, it takes less time and energy to reuse a piece of content. A Facebook post reaches different readers than does your newsletter. A video reaches the aural learner while the blog reaches the visual learner. The tweet reaches the person who is time-starved; the email campaign reaches those on your house list. Unified stories and language help make your point clear. The Rule of 7 in marketing says that a reader needs to hear your message at least seven times before she’ll respond. But the rule was created before social media. Today, the Rule of 7 can be rewritten – repurposed – to say that a reader needs to hear your messages at least seven times in a day before she’ll respond. Bottom line: you need to repeat your message for it to be heard above today’s noise. Does Repurposing Content Make You a Better Writer? Do you write a blog post the same way you write an appeal letter? Do you tweet the same way you write a new page for your web site? Writing better content is not just about subject matter. Writing better content is about packaging – that is to say, how you put together words for a particular audience to communicate that idea. That takes skill. 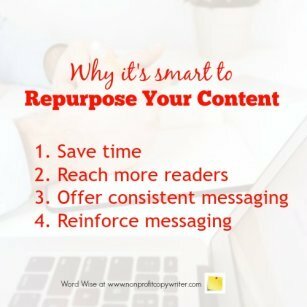 Repurposing your content makes you a better writer when you package it for the platform and the people who read it. Modify the formula to different types of content. For instance, a blog post can become the basis for an article, social media posts, and an email campaign. Repurposing your content: it’s simple. And smart.